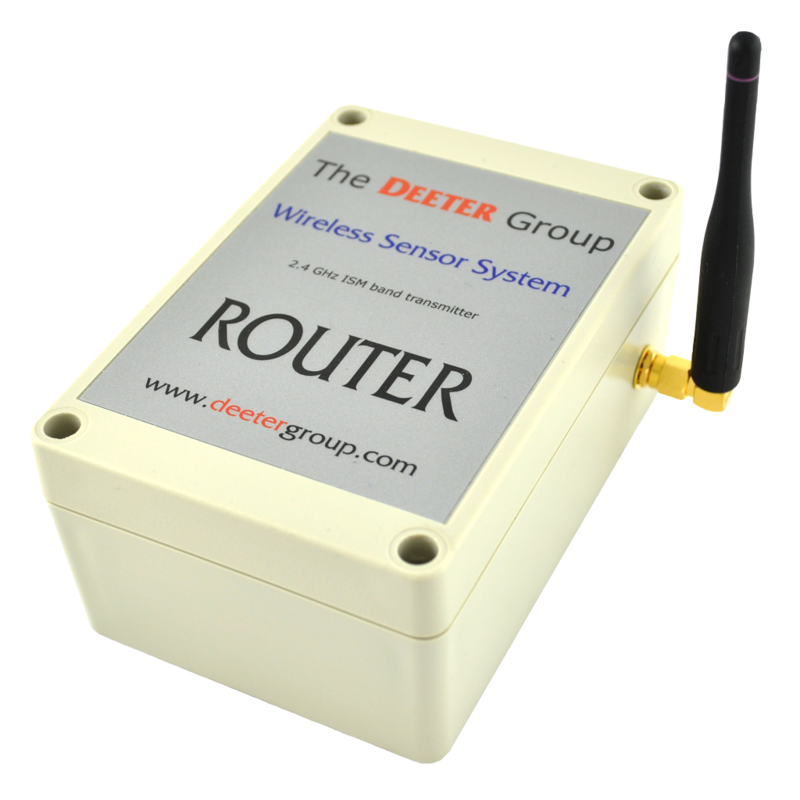 deeternet® Wireless Sensor System Router - Deeter Electronics Ltd. deeternet® Wireless Sensor System Router - Deeter Electronics Ltd.
A Router may be added to a Deeter Wireless Sensor System in order to significantly increase the radio range and to improve communications reliability. The basic wireless sensor system comprises of a Deeter Base Station and a single remote sensor node (either a Sender or LVCS-RF). The maximum achievable range between these two devices can exceed 1km. However, in many practical environments the signal can be attenuated by obstructions and fading as a result of multiple signal paths caused by reflections. These effects reduce the communications link quality and reduce the achievable range. The router enables you to overcome this by extending the range of the overall wireless system. The Wireless Router should be placed midway between the remote sensor and Base Station. It may be better to place the Router off to one side of the direct line between these two devices when there are obstructions in the direct path. The communication link quality will be improved increasing reliability. Up to four Routers may be used in a single system, with data messages passing in several hops between the remote sensor node and the Base Station. This will enable the system to transmit over an even larger range, multiplying the range four times. If multiple Routers are used then the network builds the best route between the Base Station and remote sensor node when the system is started. If communications are interrupted, perhaps as a result of an obstructing object moving into the signal path then the network rebuilds the routing table after a short delay. The Router must be permanently powered ready to relay messages. Any message sent by the Base Station to a sleeping battery powered remote sensor node will wait at the last Router until the device awakes and polls for data. Wireless communication uses the internationally recognized IEEE 802.15.4 protocol in the 2.4GHz ISM radio band. This allows users to install approved devices without needing to obtain a site licence. The Router is housed in a sturdy ABS enclosure with an external antenna. Power is supplied from a 5Vdc mains wall adapter through a cable gland. An optional extension lead and bracket kit is available for mounting the antenna remotely in an elevated position more favourable to wireless communication. 2) Conforms to European ETSI Limits.